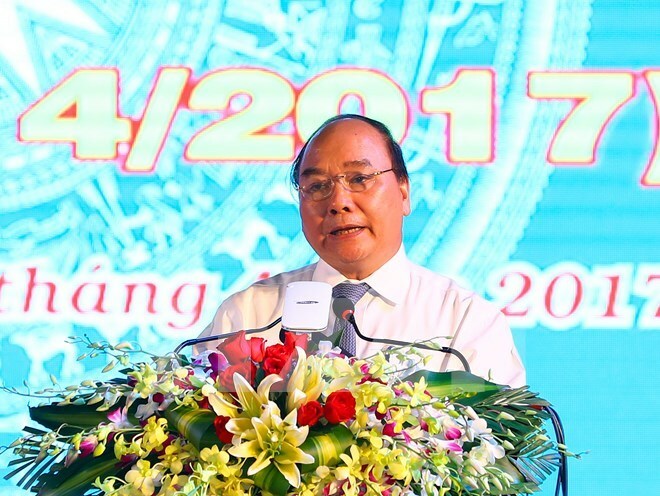 Hanoi (VNA) – A visit to Cambodia from April 24-25 by Prime Minister Nguyen Xuan Phuc will be his first official trip to the neighbouring country in the post of the Government leader of Vietnam. The visit, made at the invitation of Cambodian Prime Minister Hun Sen, is also an important diplomatic activity in the Vietnam-Cambodia Friendship Year 2017. The two countries set up diplomatic ties on June 24, 1967. They have maintained delegation exchanges at all levels, thereby consolidating mutual trust between their leaders and people. Among important visits in 2016 were a State visit to Cambodia by Vietnamese President Tran Dai Quang in June and an official visit by National Assembly Chairwoman Nguyen Thi Kim Ngan in September. While Cambodian National Assembly President Heng Samrin attended a ceremony marking 70 years of Vietnam’s first general election in January, Prime Minister Hun Sen attended the World Economic Forum on the Mekong Region in October and paid an official trip to Vietnam in December. Vietnam currently has 190 investment projects with total registered capital of 2.89 billion USD in Cambodia, focusing on agriculture and forestry. Cambodia’s investment in Vietnam has also been on the rise, with 18 projects worth 58.125 million USD at present. Bilateral trade exceeded 2.9 billion USD in 2016 and is estimated at 936 million USD in the first quarter of 2017, a year-on-year increase of 11.6 percent. The Q1 figure consists of 582 million USD of Vietnamese exports, up 8.9 percent, and 354 million USD worth of Cambodian goods, up 16.2 percent from a year earlier. About 960,000 Vietnamese people visited Cambodia and 212,000 Cambodians spent holidays in Vietnam last year. That made Vietnam the biggest source of foreign tourists to Cambodia, which in turn ranks 13th in the number of arrivals to Vietnam. Cooperation between the two sides’ ministries, sectors, localities and organisations have been reinforced through delegation exchanges, mutual support in economic development, collaboration in health care and culture, and people-to-people exchange, thus helping to maintain peace, stability, friendship and cooperation along the shared borderline. Regarding security-defence relations, the countries have enhanced coordination in sharing information and resolving issues arising along the border. They have increased joint patrols at sea and worked closely to search for and repatriate the remains of Vietnam’s volunteer soldiers who laid down in Cambodia during wars. They have also kept the principle of not allowing any hostile forces to use the territory of this country to sabotage the other country’s security and stability.